Synthetic peptide corresponding to Human Histone H3 aa 100 to the C-terminus conjugated to Keyhole Limpet Haemocyanin (KLH). WB: HeLa, Drosophila embryo nuclear extract, NIH/3T3, S.cerevisiae (Y190) and S.pombe whole cell lysates. ICC/IF: Methanol fixed HeLa cells. ChIP: Chromatin from HeLa cells. 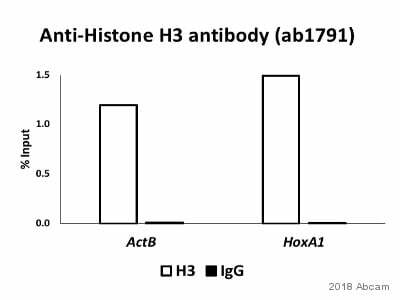 We recommend Goat Anti-Rabbit IgG H&L (HRP) (ab6721) secondary antibody. Our Abpromise guarantee covers the use of ab1791 in the following tested applications. IHC-P 1/100 - 1/400. Perform heat mediated antigen retrieval before commencing with IHC staining protocol. WB 1/1000 - 1/5000. Detects a band of approximately 17 kDa (predicted molecular weight: 15 kDa).Can be blocked with Human Histone H3 peptide (ab12149). H3 oxidation in major satellite region was determined by sequential ChIP (re-ChIP) in control and SNA1 KO MEFs. The lysate was incubated with biotin-hydrazide (an activated biotin that reacts with oxidized H3) before re-ChIP. Extracts were sequentially immunoprecipitated with anti-H3 and streptavidin beads. DNA binding was quantified by qPCR. Data were normalized to the total amount of H3 immunoprecipitated and to the input and expressed as fold enrichment over the data obtained when an irrelevant IgG was used. Chromatin from Xenopus laevis oocytes was prepared according to the Abcam X-ChIP protocol. Oocytes were fixed with formaldehyde for 10 minutes. The ChIP was performed with 25 mg of chromatin, 3 mg of ab7834 (anti-H3, light blue) and 3 µg of ab1791 (anti-H3, dark blue), and 20 ml of Protein A/G sepharose beads. A non-specific antibody was used as a control (yellow). The immunoprecipitated DNA was quantified by real time PCR (Taqman approach). This blot was produced using a 4-12% Bis-tris gel under the MES buffer system. The gel was run at 200V for 35 minutes before being transferred onto a Nitrocellulose membrane at 30V for 70 minutes. The membrane was then blocked for an hour using 2% Bovine Serum Albumin before being incubated with ab1791 overnight at 4°C. 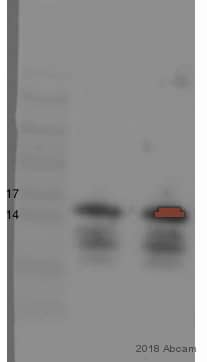 Goat Anti-Rabbit IgG H&L (HRP) (ab6721) secondary antibody was used for detection. Antibody binding was visualised using ECL development solution ab133406. Rabbit polyclonal to Histone H3 (ab1791) at 1/5000 on S. cerevisiae whole cell lysate (40 ug per lane). 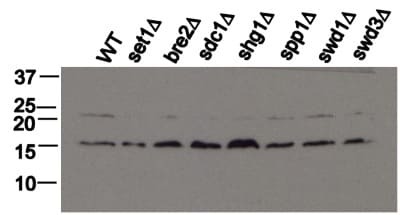 Protein resolved on 15% SDS-PAGE gel. After transfer to PVDF membrane, blots were blocked in 1X PBS, 0.1% Tween-20, and 5% milk. ab1791 was diluted in 5 ml blocking buffer at 1/5000. Blots plus primary antibodies were either incubated overnight at 4°C or at RT for 2 hours. Blots were washed 6X for 10 minutes each in PBS with 0.1% Tween-20 before addition of secondary antibodies. Secondary antibodies were diluted 1/2,000 in blocking buffer and incubated with blots for 2 hours at RT. Secondary blots were washed 4X for 10 minutes each in PBS with 0.1% Tween-20 and 2X for 10 minutes each in PBS. ab1791 staining Histone H3 in HeLa (Human epithelial cell line from cervix adenocarcinoma) by ICC/IF (Immunocytochemistry/immunofluorescence). Cells were fixed with methanol and blocked with 0.2% fish scale gelatin for 1 hour at 25°C. Samples were incubated with the primary antibody (1/300 in PBS + 0.2% gelatin) for 20 minutes at 25°C. An Alexa Fluor® 488-conjugated donkey anti-rabbit IgG polyclonal (1/500) was used as the secondary antibody. Paraffin-embedded rat brain tissue stained for Histone H3 using ab1791 at 1/8000 dilution in immunohistochemical analysis. The ChIP was performed with chromatin from mouse gut cell lysate and ab1791 at 1/250 dilution. Negative control: No antibody was used (right bar). The immunoprecipitated DNA was quantified by real time PCR. ab1796 staining Histone H3 in mouse liver tissue sections by Immunohistochemistry (IHC-P - paraformaldehyde-fixed, paraffin-embedded sections). Tissue was fixed with paraformaldehyde, permeabilized with 0.05% Triton X-100 in PBS for 30 minutes and blocked with 5% BSA for 1 hour; antigen retrieval was by heat mediation in sodium citrate pH 6. Samples were incubated with the primary antibody (1/500 in blocking buffer) for 16 hours at 4°C. An Alexa Fluor® 488-conjugated goat anti-rabbit IgG polyclonal (1/400) was used as the secondary antibody. 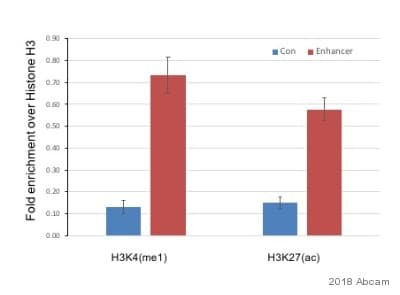 Histone H3 - ChIP Grade was immunoprecipitated using 0.5mg HeLa (Human epithelial cell line from cervix adenocarcinoma) whole cell extract, 5 µg of Rabbit polyclonal to and 50 µl of protein G magnetic beads (+). No antibody was added to the control (-). The antibody was incubated under agitation with Protein G beads for 10 minutes, HeLa whole cell extract lysate diluted in RIPA buffer was added to each sample and incubated for a further 10 minutes under agitation. Proteins were eluted by addition of 40 µl SDS loading buffer and incubated for 10 minutes at 70°C; 10 µl of each sample was separated on a SDS PAGE gel, transferred to a nitrocellulose membrane, blocked with 5% BSA and probed with ab1791. 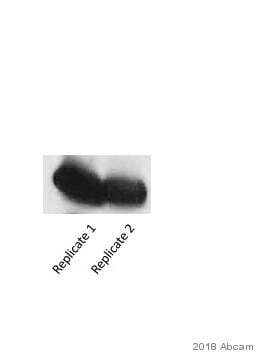 Secondary Antibody: Mouse anti-rabbit HRP light chain (HRP) (ab99697). ab1791 staining Histone H3 in human infantile fibromatosis tissue sections by Immunohistochemistry (IHC-P - paraformaldehyde-fixed, paraffin-embedded sections). Tissue was fixed with formaldehyde and blocked with 1% FBS/BSA for 3 hours at room temperature; antigen retrieval was by heat mediation in Tris pH 9. Samples were incubated with primary antibody (1/100 in TBS + 1% BSA + 1% FBS) for 16 hours. An un-diluted HRP-conjugated goat anti-rabbit IgG polyclonal was used as the secondary antibody. ab1791 staining Histone H3 (red) in rat brain tissue sections by Immunohistochemistry (IHC-P - paraformaldehyde-fixed, paraffin-embedded sections). Tissue was fixed with formaldehyde, permeabilized with 0.1% TBS-TritonX and blocked with 10% serum for 1 hour at 25°C; antigen retrieval was by heat mediation in a citrate buffer. Samples were incubated with the primary antibody (1/500 in 10% normal goat serum) for 24 hours at 24°C. An Alexa Fluor® 594-conjugated goat anti-rabbit IgG polyclonal (1/500) was used as the secondary antibody. Red - Histone H3 staining. Blocked with 3% milk for 1 hour at 25°C. Incubated with the primary antibody for 16 hours at 4°C in 3% milk in TBS-tween. Cells were fixed with formaldehyde for 10 minutes. The ChIP was performed with 25 µg of chromatin, 2 µg of ab1791 (blue), and 20 µl of Protein A/G sepharose beads. No antibody was added to the beads control (yellow). The immunoprecipitated DNA was quantified by real time PCR (Taqman approach for active and inactive loci, Sybr green approach for heterochromatic loci). Primers and probes are located in the first kb of the transcribed region. ab1791 staining mouse embryonic stem cells by flow cytometry (gated on all living cells). The cell colonies were trypsinized and incubated with the antibody 1ug/1.5 x 105cells in a permeabilization buffer. 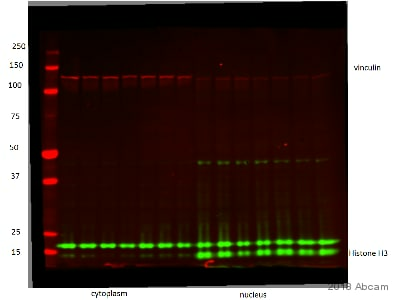 A PE conjugated goat anti-rabbit antibody was used as the secondary. Histone H3 immunogold detection in HeLa cells. Ulltra-thin sections of paraformaldehyde-fixed, Lowicryl K4M embedded cells were incubated sequentially with ab1791 antibody and an anti-rabbit antibody coupled to 10 nm gold particles. Notice absence of chromatin within Interchromatin Granules (IG), a reservoir of spliceosomal snRNPs, and high labeling of patches of condensed chromatin close to the nuclear envelope (arrows). Nu: nucleus, Cyt: cytoplasm. Image courtesy of Gerard Pierron, IGR-Villejuif, France. Fixative : either paraformaldehyde 4% or 1.6% glutaraldehyde in 0.1M Millonig’s buffer. Embedding : in Lowicryl 4KM at -20°C under UV. Ultrathin-sections deposited on formvar-coated carbonated EM-grids. Blocking step: 5% BSA for 30 seconds at RT. Primary antibody: ab1791 diluted 1/50 in PBS, for 1h at RT. ab1791 staining Histone H3 in adult mouse brain, dentate gyrus tissue sections by Immunohistochemistry (IHC-Fr - frozen sections). Tissue was fixed with paraformaldehyde, blocked with 1% BSA for 30 minutes at 25°C. Samples were incubated with primary antibody (1/500 TBS +TritonX-100 (0.05% Donkey serum 3%) for 12 hours at 4°C. 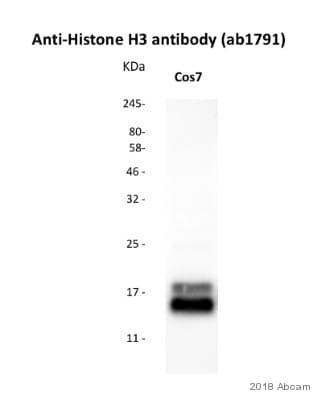 Un-diluted ab175471 was used as the secondary antibody. Publishing research using ab1791? Please let us know so that we can cite the reference in this datasheet. I had a few questions regarding ab1791. Does the Ab1791 antibody recognize all the variant forms of H3? Do you know the ratio of expression between the different variant forms in human cell lines? Our antibody ab1791 will recognize total Histone H3 in your samples, so it will recognize the modified forms of Histone H3. Unfortunately I am unaware of the ratio of expression between the different variant forms in human cell lines. I am looking to conduct and IF assay using ab1791, with human samples. However, the host of the antibody cannot be rabbit. Is ab1791 a suitable candidate for the antibody? If not, could you please recommend another antibody? I am happy to let you know that we have non-rabbit anti-human Histone H3 antibodies available, which also qualify for our testing discount programme (either because of their potential suitability for IF or because we do not have an image yet). https://www.abcam.com/index.html?datasheet=10799 (or use the following: https://www.abcam.com/index.html?datasheet=10799). https://www.abcam.com/index.html?datasheet=128012 (or use the following: https://www.abcam.com/index.html?datasheet=128012). Also, I could recommend our favourite rabbit polyclonal ab1791. I assume the customer is performing a costaining with another rabbit antibody and thus wants to avoid a rabbit anti-Histone H3 antibody. However, I am pleased to let you know that with our Easy Link kits this problem can be solved: You can easily label any primary antibody with a conjugate of your choice and eliminate the need for secondary antibodies. Please find more information under https://www.abcam.com/Easylink.